Objective: Stabilise the knee joint against too great a lateral twist (especially valgus twist) without reducing the normal mobility of the knee. The tape is utilised the whole day in the beginning of the course, being gradually reduced over the following three months. The tape is finally only used in connection with particular loads where there is risk attached. Application: The knee should be kept slightly bent (approx. 20 degrees flexion) during the application of the tape. Rotation of the knee should be avoided, which is best achieved by applying the tape on a standing patient with the leg to be taped on a 10-15 cm raised platform with the knee bent over the toes. Two anchors (A & B) are positioned approximately 10 cm over the joint line of the thigh and approximately 10 cm under the joint line of the lower leg respectively. These anchors should be open to the rear. A supporting tape (C) is applied from the anchor on the thigh, starting in the middle of the inner thigh and following the thigh length-wise downwards, continuing down to the lower leg. Because of the bend in the knee, the tape will be drawn to the front of the leg to be attached to the anchor. A supporting tape (D) is applied from the anchor on the lower leg, starting in the middle of the inner calf and following the leg length-wise upwards to the thigh. Due to the bend in the knee the tape will be drawn to the front of the thigh to be attached to the anchor. 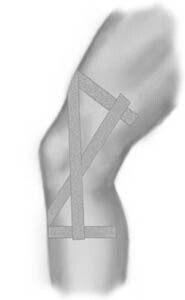 These two supporting strips now cross each other at the exact spot corresponding to the joint line, and consequently enables acceptable knee mobility. A third supporting tape can be applied between the two already in place. Finish with a further strip on top of each anchor A & B.